If you have always dreamed of being an animal care specialist, now is your chance! And, you can also, work side by side with our animal care staff as they care for the animals that call Brookfield Zoo home. Whether you love birds or snakes, big animals, or little critters--we have a Backstage Adventure just for you. Get started by choosing the animal you like best or your favorite exhibit. Try one or try them all--the adventures are endless! Once you have booked your Backstage Adventure: Ten days prior to your program you will receive a reminder e-mail with details on what to expect from your program, where to park, and information on where your program will meet. This e-mail reminder will serve as your program confirmation and entry into the zoo. Please watch for this e-mail to arrive from backstageadventures@czs.org. We suggest adding this address to your trusted contacts list to ensure that you receive all pertinent communications. If you do not receive this e-mail, please e-mail backstageadventures@czs.org. Poolside Penguin Feeding - 2019 Dates Now Available! Welcome to the Poolside Penguin Feeding Backstage Adventure! During your Adventure you will enter the Rocky Shores habitat, which is located in The Living Coast, and help the animal care staff feed the penguins. Each Adventure lasts approximately 30 minutes, depending on the appetite of the penguins and their moods that day. Zoo admission and parking are NOT included in the Adventure price. Participants must be at least 12 years old. Each Adventure is limited to 2 Participants. For the safety of the penguins you will not be permitted to take pictures during your Adventure. Family members or friends will be able to take pictures for you from the guest areas located in front of the habitat. You must be on Time: Because the penguin feedings are on a set schedule they must start on time. If you’re late the feeding will proceed without you. The following policies are in place because making our Backstage Adventures the best possible experience they can be requires months of planning, preparation, and investment of staff resources. Upon making a reservation, we reserve a space for your party. In doing so, we are barring others from signing up as we have limited programs available. A non-refundable and non-transferable deposit is applied at the time of reservation (25% of your total reservation). Refunds are available, minus the deposit fee, up to 14 days prior to your program. Participants may be rescheduled to a different program date presuming available space. Less than 14 days prior, refunds and rescheduling are no longer possible. Participants who show up late to their program will not be able to extend the length of their program, receive a refund, or reschedule to another date. Chillin' with Da Bears - New in 2019! The animal care team in Great Bear Wilderness will guide you through the up close and personal care of the brown bears and polar bears. Learn about natural history, conservation statuses, feeding strategies, environmental enrichment, training and more! We will even explore one of the bear habitats, provide some enrichment, and you can watch them shift onto exhibit from the public walkway. Eligible Participants: Guests age 12 or older. Guests who are age 12 - 17 must be accompanied by a paid adult participant (additional registration fee required). Maximum number of participants: Up to 5 We cannot accommodate more than five total guests per program. 1.) Click here to review program details to prepare for your adventure. 2.) Register online by clicking the link below. 3.) Print your confirmation page. 4.) Complete your participation waiver and return to us at least 10 days prior to your program. We are unable to offer the program without this waiver. Failure to return this waiver will result in your program's cancellation. 5.) Ten days prior to your Backstage Adventure you will receive a reminder e-mail with details on what to expect from your program, where to park, and map indicating where to meet your host. In this behind-the-scenes adventure, participants will learn about Chicago Zoological Society’s dolphin program at Brookfield Zoo while enjoying an interactive experience with a dolphin. Each adventure begins with a tour at Seven Seas where you will learn about the ways we care for our dolphins, our conservation programs, and then get ready to meet one of the dolphins up close and personal. Participants will participate in our dolphin care session where they will spend time learning about their anatomy, physiology, and some individual characteristics. The experience culminates with a unique take-home gift for each participant. B.) an adult chaperone who does not pay a fee to attend. Maximum number of participants: 2 (This can be two children age 12 - 17; one child and one chaperone; or two adults 18 or older) We cannot accommodate more than two total guests per program. To ensure the safety of all involved, only the registered program participants will be allowed in the areas where the program is taking place. Hanging with the Herps - 2019 Dates Now Available! The animal care staff in Feather and Scales will guide you through the fascinating world of frogs, snakes, lizards, turtles, amphibians, and reptiles - a.k.a. the herptiles (“Herps” to their friends.) Learn about handling reptiles, how to use a heat sensor to record environmental data, feeding strategies, environmental enrichment, and more! Guaranteed to make you a lizard lover and frog fan. Maximum number of participants: 2 (This can be two children age 8 - 17; one child and one chaperone; or two adults 18 or older) We cannot accommodate more than two total guests per program. Junior Animal Care Specialist- 2019 Dates Now Available! Perfect for the young animal lover in your life, Junior Animal Care Specialist is a unique, hands-on experience your child will never forget. See parts of the Hamill Family Play Zoo and Animal Ambassador Embassy that only animal care staff get to see and meet some of our new Animal Ambassadors. Tamandua, sloth and wallaby are just a few of the animal ambassadors your child may connect during this experience. Eligible Participants: Guests age 7 to 14. Children must be accompanied by an adult chaperone. Junior Reptile Care Specialist- 2019 Dates Now Available! Perfect for the young reptile lover in your life, Junior Reptile Care Specialist is a unique, hands-on experience your child will never forget. The adventure starts with small lizards and snakes at the Feathers and Scales exhibit, then continues at Reptiles and Birds which is home to the Galapagos tortoises and monitor. The experience concludes at The Swamp where the Orinoco crocodiles and alligator snapping turtle reside. See parts of the exhibits only animal care staff get to see and meet and feed some of the reptiles that live there. Eligible Participants: Guests age 8 to 16. Children must be accompanied by an adult chaperone. Lions, Tigers, and Bears, Oh My! - New in 2019! Have you ever wanted that ‘Once in a Lifetime’ moment? That is exactly what you will experience with the Lions, Tigers and Bears, Oh My Backstage Adventure! Keepers will guide you through a morning on the Big Cat Run here at Brookfield Zoo. Go behind the scenes and learn about the extensive care our cats and sloth bears receive. You will even experience a training session with one of our big cats. Guaranteed to make anyone a cat lover. Marvelous Marsupials - 2019 Dates Now Available! Take a trip down under and meet the animals of Australia House. Hang with wombats, kangaroo and wallaby and see these amazing creatures up close. Your outback adventure awaits! Ever been curious about what the animals eat? Or how we feed 2,500 animals from 250+ species every day? Then join us for the Nuts for Nutrition Backstage Adventure! Participate in diet preparation for a multitude of animals and see how we get it all done. Rainforest Aviary Feeding Adventure - New in 2019! On this Adventure, you will assist our animal care specialists in preparing the food for the 12:00 noon feeding of our rainforest birds in Feathers & Scales. You will learn how we present the different foods to accommodate the different feeding habits of each species. Once the preparations are complete, you will assist the staff with placing the food in the habitat. As the different birds come down to eat, you will be able to learn which foods are the favorites of the different species. Each Adventure lasts approximately 30 minutes, depending on the appetite of the birds and their moods that day. Eligible Participants: Guests age 8 or older. Guests who are age 8 - 17 must be accompanied by an adult. Maximum number of participants: 2 We cannot accommodate more than two total guests per program. Stars with Stripes - 2019 Dates Now Available! Participants will assist in the daily care of the zebras. Help the animal care staff as they clean and prepare the exhibit space. You will also help prepare and offer diet items. Daily enrichment will be prepared and placed on exhibit for the zebras. End your adventure by observing a training session and/or participating in a zebra feeding experience. Maximum number of participants: 2 (This can be two children age 12 - 17; one child and one chaperone; or two adults 18 or older) We cannot accommodate more than two total guests per program. Swamp Things - 2019 Dates Now Available! Ever feel you were “born on the bayou,” or do you just love swamps? Check out our Backstage Adventures program in The Swamp. Work with animal care staff as they care for a wide variety of creatures, from swamps around the world, including birds, insects, fish, and otters. World of Wolves - New in 2019! See the Brookfield Zoo wolf pack up close and learn about the Mexican Gray Wolf Recovery Program. Keepers will explain about the wolves’ zoo care, social structure, and re-introduction into the wild, including Chicago Zoological Society’s contributions to recovery in the Southwest. The experience includes a tour of behind-the-scenes keeper areas and observing a wolf feeding. Have questions? Contact the Animal Programs Department at backstageadventures@czs.org! 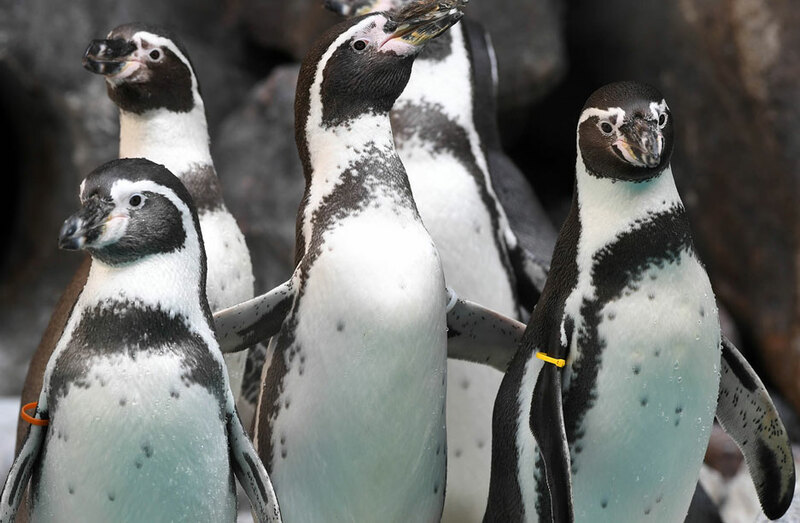 Join us for a unique close encounter with Humboldt penguins at Brookfield Zoo. Parents and young explorers can experience serious fun at one of our Family Play Classes! To show appreciation for the hard work and dedication of the men and women in the United States Armed Forces, the Chicago Zoological Society is offering free admission to Brookfield Zoo to all active, reservist, and retired members of the military. Qualified personnel who present a valid ID at one of the zoo's admission booths will be admitted free of charge. Sign up for the latest from Chicago Zoological Society's Brookfield Zoo and receive regular updates and special offers direct to your Z-mail inbox! The Chicago Zoological Society is a private nonprofit organization that operates Brookfield Zoo on land owned by the Forest Preserves of Cook County. AZA Accredited. © 2019 Chicago Zoological Society. All Rights Reserved.